Icing Designs: Dress up those marshmallows! We love using chocolate covered marshmallows on dessert tables! They are so easy and so delicious! Of course it is super easy to just dip them into white, dark or milk chocolate and cover with colorful sprinkles that compliment your dessert table! We used one of our cupcake flags, dipped the marshmallow in white chocolate and decorated it with pink pearlized sprinkles. Cupcake flags aren't just for cupcakes anymore! We took this one and dipped it in melted peanut butter chips, let it dry and then dipped it again half way up with melted mik chocolate...so good! Cookies and Cream anyone? This marshmallow was dipped in white chocolate and then rolled in crushed oreos!! We popped it in a black and white mini cupcake liner just to dress it up a bit! This one is turtle inspired! We just melted some caramel candies (let them cool a little bit before you dip the marshmallow or it will melt) dipped the marshmallow in and let it cool, then dipped it again in milk chocolate and rolled the bottom in crushed pecans! How could we leave out the smores inspired marshmallow! We dipped this one in milk chocolate and rolled it in crushed graham crackers! Super easy...and super delicious! Finally, this is one of our favorite things to do for first birthdays! Dip the marshmallow in white chocolate and let it dry, then dip the top in chocolate (or use any color you would like) and add some sprinkles and put a chocolate candle on top! add a cupcake liner and you have a little cupcake! We will show you step by step tomorrow, how to make these...they are really easy! There are really so many possibilites for marshmallows, just use chocolate as your glue and roll them in; toasted coconut, mini m&m's, crushed chocolate chip cookies, mini chocolate chips, nuts....anything your heart desires! Another fun idea would be to have a DIY marshmallow bar...use cake plates to display marshmallows with lolli sticks already in them and use a fondue pot to contain the melted chocolate and then put all of your toppings in separate little ramekins...so everyone can make their own dressed up marshmallow! love it!!! no more naked marshmallows...these all look DELISH!!! These are adorable! 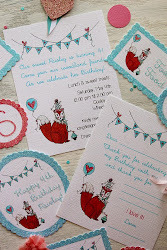 Love the use of the cupcake toppers, very smart! What a cute idea! They're adorable, I think my favorite one is the peanut butter and chocolate. This is SO cute! I can see this being customized for nearly any theme or age group! You should check out the post I did on Chocolate Peanut Butter Cheesecake Pops. Another alternative to the popular cake balls. Oh how cute! This would have been super cute at my daughters party! Wow! They look so easy to make! I'm going to have to give it a try now. Thanks!! 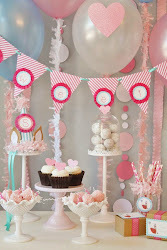 I love, love the tiny marshmallow birthday cake - how adorable! I'll be watching for step by step instructions tomorrow. I love this idea so much! How cute! Absolutely perfect. Okay, these are so great! Love the whole idea! I love this idea! I think I'll try it and bring treats to work soon! How Addorable! I'm in love with them. Were ever did you find the mini cup cake wrappers? Hi...we found them at layer bake shop...they have so many cute mini cupcake liners! Combine the marshmallows and water together in a bowl, and melt them in the microwave. Add the powdered sugar, and keep stirring it in until the mixture reaches the texture of bread dough.